Jimmy Ferris - Belfast Celtic's "Brilliant Schemer"
Milltown Cemetery keeps many Falls Road secrets and Belfast Celtic legends like Charlie Tully, Jackie Vernon and Kevin McAlinden rest quietly among its graves. Another secret lies peacefully nearby – a remarkable footballer whose name has been lost in time. Jimmy Ferris was born in Belfast in 1894 and enjoyed a trophy-filled 17 year career before serious illness brought it to an end. Pulling on the white jersey of Distillery in 1914, successful Co. Antrim Shield and Charity Cup campaigns alerted Belfast Celtic and he swapped the ‘Whites’ for Celtic’s ‘Stripes’ ahead of the 1917/18 league season. 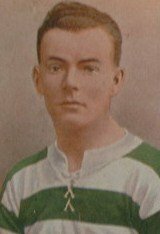 Making an immediate impact at inside-forward, with legends like Elisha Scott, Willie McStay from Glasgow and the magical Mickey Hammill, Ferris helped Celtic to its first ever Irish Cup win in 1918. 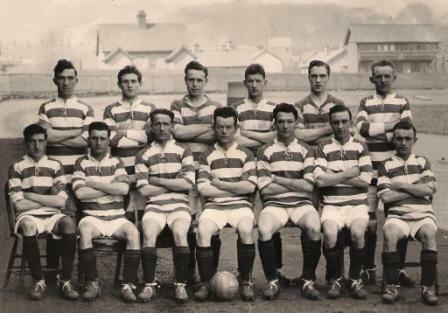 A league title followed in 1919, as Celtic headed for the period of football dominance that would surely follow in the years after the First World War. Alas, as the Tan War reached a ferocious crescendo in the early 20’s, Belfast’s Pogroms would impact fiercely on the city’s Catholic community and the football team carrying its colours. When he rifled a goal against Glenavon in May 1920, its doubtful Ferris realised it would be the last scored by Celtic in competitive football for four years. As well as being a city centre shopkeeper, Dan McCann served as Belfast Celtic Chairman between 1905 and 1923. While at work one day, a policeman entered his premises with grave and startling news. McCann was the imminent target for the murder gang led by RUC Officers Nixon and Harrison, who were wreaking havoc on the Catholic community across the city – the peeler had overheard chatter that McCann was to be executed and the gang were on their way to kill him. Hastily putting on his hat, McCann slung his coat across his back, left his shop and fled Belfast. The tip off from the conscientious copper had saved his life. Surrounded by the conflict, many of Belfast Celtic’s stars were also exiled, with Jimmy Ferris finding himself in London in 1920, playing for Chelsea with another Belfast Celt, Fred ‘Rocking Horse’ Barrett. Already an established international player, Ferris had scored a 70 th minute equalizer for Ireland the previous autumn against England at Windsor Park. No doubt, this strike had alerted the dealmakers at Stamford Bridge to Ferris’ prowess, which again shone in a 2-2 draw for the Irish League against the English Football League at Anfield in Liverpool just a month later. But he failed to settle in the English capital and after a spell at Preston (where he’s still remembered as a hat-trick hero) and then Welsh club Pontypridd, Ferris was back at Belfast Celtic, who had re-entered the league for the 1924-25 season. And so began one of Celtic’s golden eras. Inspired by Ferris and his returned immigrant partner Mickey Hamill. They won the league four years in a row between 1925 and 1929, losing only one match in the process. As Celtic’s late historian Bill McKavanagh smartly put it, the other Irish league clubs had found, to their despair, the trophies they lifted while Celtic were out of football were merely on loan! Ferris was the engine of the Belfast Celtic machine in the late 20’s, with the Irish News dubbing him ‘a brilliant schemer’, setting up goals for his partners on a plate. Apart from his football skills, his tricky ring smarts were like those of a wily boxer, rather than a ‘dainty’ footballer, as he was once described. just where he liked it, pictured in the Belfast Celtic squad of 1924. For example, the 1926 Irish Cup Final was proving a frustrating encounter, as Linfield’s centre-half Barney Moorhead was paying close attention to Celtic’s striker, the beloved ‘Blind’ Sammy Curran (nicknamed because, it was said, he only had eyes for the goal). Reports from the time tell of Ferris closing in on Moorhead, before leveling him with a ferocious kick! Enraged, a vengeful Moorehead spent the rest of the game tracking Ferris around the pitch, allowing ‘Blind’ Sammy to run riot and score all three of Celtic’s goals in a 3-2 win. The Irish Cup was on its way back to Paradise for only the second time in Celtic’s history. Ferris’s final Irish international cap was secured at Firhill in Glasgow in 1928, where a record crowd of 54,000 watched he and Curran inspire Ireland to victory, but he was soon to be diagnosed with a serious heart condition that would end his glittering career. Belfast Celtic however, were not to lose his services and he was widely credited with bringing Davy ‘Boy’ Martin to Paradise, when employed as a talent scout. 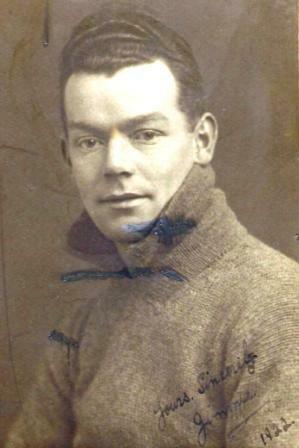 Martin would prove his worth later when his transfer to Wolves, along with Johnny Brown, netted Celtic a fee of £7,500 – and unbelievably large transfer fee in the austere days of the mid-1930’s. Ferris, sadly, would never see this move. In 1932, aged only 37, he tragically died and made the well trekked journey from his home in Frere Street in Smithfield to Milltown, where he rests just up the steps to the right of the main gates. It is hoped his resting place will soon be added to the new Celtic Trail, in the final stages of planning by the Belfast Celtic Society, helping reveal the secret of one of Ireland’s lost football greats! The Belfast Celtic Museum at the Park Centre will be open this Saturday, September 25, from 12 noon until 5.00pm.